If you were looking for a way to eat more and different millets, then you have come to the right place. After years of talking about millets I realized I had only been using finger millet and more recently foxtail millet whereas there are so many more kinds of millet! Was I ready to expand my millet horizons? Well I took the first step and bought every variety of millet our local store stocked. Sorghum (జొన్నలు) Kodo Millet (అరికెలు), Proso Millet (వరిగులు), Pearl Millet (సజ్జలు), Foxtail Millet (కొర్ర బీయము), Barnyard Millet (ఒడలు) . and Little Millet (సామ బీయము). whew! And of course our usual Finger Millet (రాగులు), sprouted. A few weeks later I saw that the finger millet was steadily depleting but the rest of the bags were lying serenely in the shelf. So I decided to try the Kodo Millet. Could I make idlis with it, using it in lieu of part of the rice? How about Kodo Millet Dosas? A quick internet search reassured me that I could even use it in lieu of all of the rice but to start with I decided to use an equal portion of rice, kodo millet and urad dal. Well, I have nothing to report because they came out just like usual idlis. Maybe even softer. No one even guessed that they were different until I told them. The dosas were fluffy as well. Take equal parts of kodo millet, rice and urad dal (black gram). Soak the kodo, rice and urad . Can soak them separately or all together, as shown. Grind to a smooth batter. Pour kodo millet dough into pans. Place pans in the idli steamer on medium high flame for 20 minutes. It seems like almost any millet will work for idli and dosa so it is just a matter of trying them one by one. What could be easier? I have been hearing people like Dinesh of Earth 360 and Sunitha of AID Seattle saying that we should not be using only one type of grain for everything, and that all the dishes we made with rice we could make with various millets, and though I believed them now I believe! Well now I must confess that I was not entirely accurate before when I sad that you had come to the right place, actually there are MUCH better recipes for all kinds of millet all over the internet. Such as Very Good Recipes – Millet. But if, like me, you are daunted by such beautiful recipes, then I hope by posting super simple recipes I can help you take the first step towards adding millets to your meals. 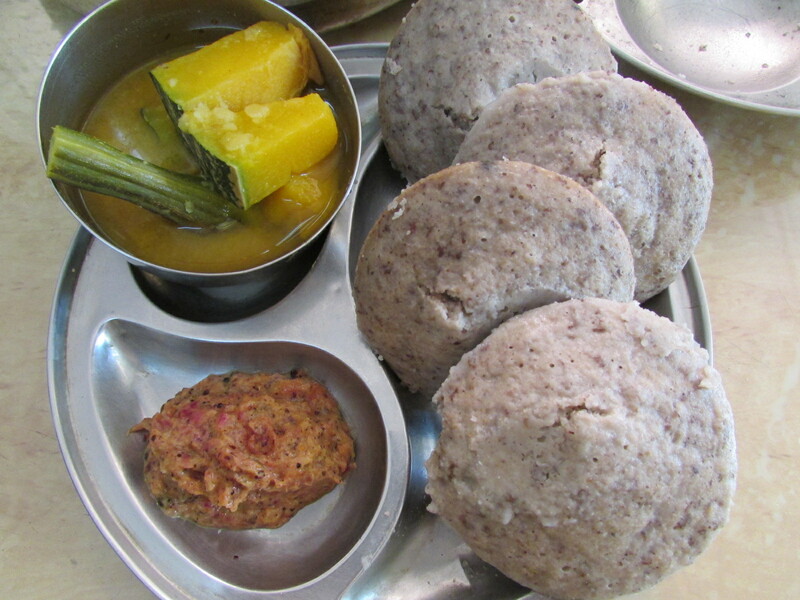 I have since made these idlis without any rice at all. I used 2 parts kodo millet and 1 part urad or urad dal. Soak, grind, let ferment and prepare as usual. Makes delicious dosas too! And to show you how it is done, may I present Khiyali, host of the Young Person’s Cookery Show! where did you purchase your kodo from? what specific rice varietal you used in the picture? If you find some near you, it would be most helpful if you could stop by here and let us know where you got it.